CROSS PLANES: I survived the A to Z Blogging Challenge of 2016. This was my fifth year and I was better prepared then any previous year. 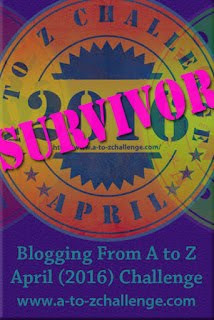 By the time April 1st rolled around, I had posts done through M...and I'm glad, but the lead quickly got swallowed up. This year was different, because I kept it all story-based, no stats for RPGs of any kind. It was interesting simply flexing my descriptive muscles for a change, but scary too. I just had my words and ideas to fall back on and nothing to hid behind. I guess it's time to start thinking about next year's theme.